Eyelet curtains are traditional contemporary ones which have eyelet(metal rings) on the top of the fabrics that is connected with curtain pole, so this doesn’t require more material as they don’t need to be gathered like taped heading. 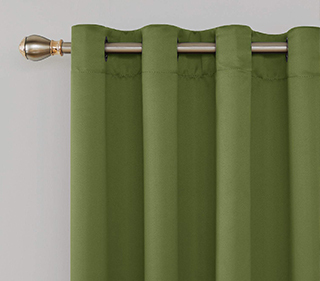 These curtains are quick and easy to fit in small, medium and large doors or windows. These are soft pleated, sleek designed which gives classic traditional look and also economically friendly. Eyelet curtains are available in wide range of sizes, colours and designs to suit a variety of interiors.